↑ Kot, Jacek (2011). Educational and Training Standards for Physicians in Diving and Hyperbaric Medicine (PDF). Kiel, Germany: Joint Educational Subcommittee of the European Committee for Hyperbaric Medicine (ECHM) and the European Diving Technical Committee (EDTC). สืบค้นเมื่อ 30 March 2013. ↑ Staff. "Competencies of a recreational scuba diver at level 2 "Autonomous Diver"". EUF Certification International. Archived from the original on 29 October 2013. สืบค้นเมื่อ 29 September 2013. ↑ Brylske, A. (2006). Encyclopedia of Recreational Diving (3rd ed.). Rancho Santa Margarita, California: PADI. ISBN 1-878663-01-1. ↑ Comex SA. "Innovation in extreme environments". Compagnie maritime d'expertises. สืบค้นเมื่อ 11 November 2016. ↑ Logico, Mark G. (4 August 2006). "Navy Chief Submerges 2,000 Feet, Sets Record, Story Number: NNS060804-10". Official Website of the United States Navy. U.S. Navy. สืบค้นเมื่อ 3 November 2016. ↑ Staff (2016). "Hardsuit depth record". Nuytco Research Ltd. สืบค้นเมื่อ 24 September 2016. ↑ 7.0 7.1 Busuttili, Mike; Holbrook, Mike; Ridley, Gordon; Todd, Mike, eds. (1985). "Using basic equipment". Sport diving – The British Sub-Aqua Club Diving Manual. London: Stanley Paul & Co Ltd. p. 58. ISBN 0-09-163831-3. ↑ Ostrovsky, Igor. "Aquathon". History of Underwater Sports. World Underwater Federation (CMAS). สืบค้นเมื่อ 9 November 2016. ↑ Ucuzal, Levent. "Apnoea". History of Underwater Sports. Rome: World Underwater Federation (CMAS). สืบค้นเมื่อ 9 November 2016. ↑ Staff. "Hockey". History of Underwater Sports. World Underwater Federation (CMAS). สืบค้นเมื่อ 9 November 2016. ↑ Wiesner, Rudi. "Rugby". History of Underwater Sports. World Underwater Federation (CMAS). สืบค้นเมื่อ 9 November 2016. ↑ Staff. "Spearfishing". History of Underwater Sports. World Underwater Federation (CMAS). สืบค้นเมื่อ 9 November 2016. ↑ ﻿North Pacific Acoustic Laboratory: Environmental Impact Statement﻿ (รายงาน). 1. Arlington, Virginia: Office of Naval Research. 2001. pp. 3–45. https://books.google.com/books?id=fKo4AQAAMAAJ&pg=SA3-PA45. 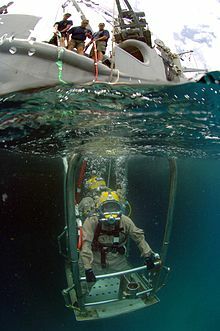 ↑ US Navy Diving Manual 2006, Chapter 1 Section 3 Scuba Diving. หน้านี้แก้ไขล่าสุดเมื่อวันที่ 19 ธันวาคม 2561 เวลา 17:41 น.